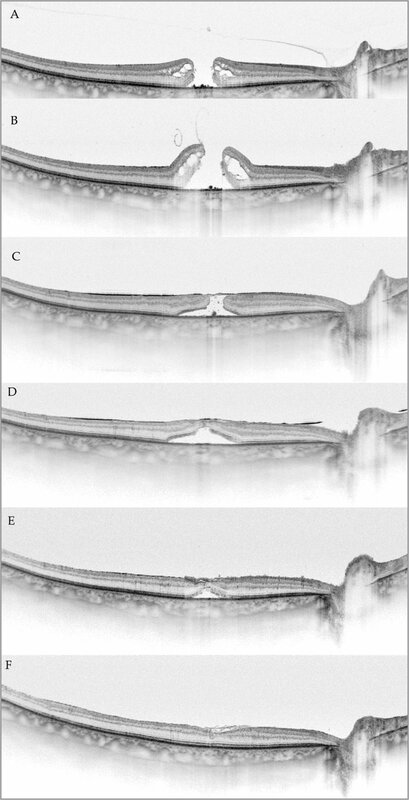 Effects of repeat surgery in failed primary full-thickness macular hole (FTMH) closure with the inverted internal limiting membrane (ILM) flap technique. Retrospective analysis of patients operated with the inverted ILM flap technique. Optical coherence tomography was performed before initial and secondary surgeries and then at up to 12 months post-surgery. During the second surgery, the inverted ILM flap created at the first attempt had returned to its original position, instead of covering the FTMH. FTMH was closed in 29 eyes after second surgery (89%) and in all eyes after third surgery. Visual acuity improved in 28 of 32 cases (87.5%). The tamponade used (either silicone oil or air) did not influence final visual results (P = .06). Repeat surgery with the inverted ILM flap technique is an effective method of treatment. Silicone oil improved anatomical outcome after second surgery but did not influence visual results. 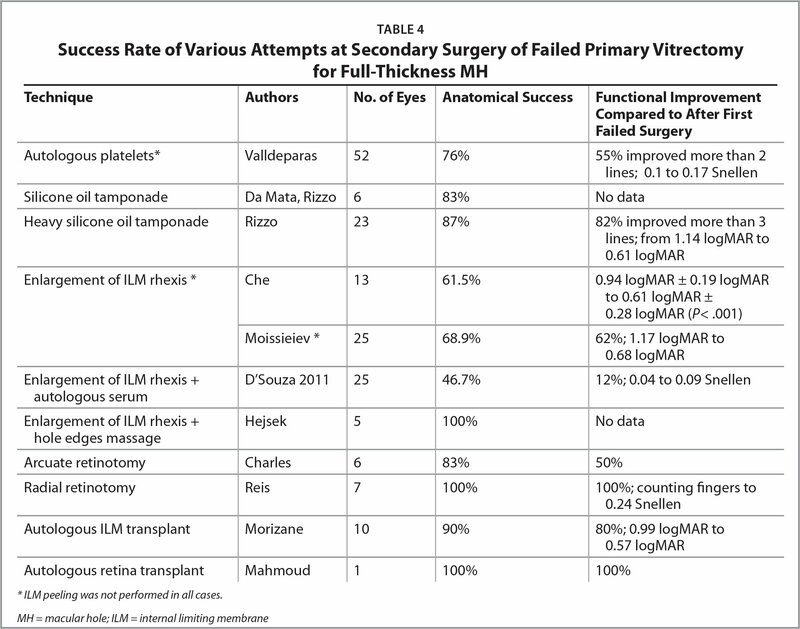 Despite significant improvements in vitreoretinal surgery and the fact that in noncomplicated small macular holes (MHs), the success rate may reach 100%,1 in more complicated cases, up to 39% of MHs may remain unclosed after vitrectomy, which includes either flat open or elevated open postoperative appearance.2,3,4 The failure rate increases with preoperative MH size and hole duration, as well as in cases of high myopic MHs. There is no consensus as to which technique should be used during repeated surgery. Various techniques have been employed to improve the closure rates of complicated MHs and even in the more problematic cases of secondary surgery. These include using: silicone oil tamponade,5,6,7,8 arcuate or radial retinal incisions around the MH,9,10 widening of the area of internal limiting membrane (ILM) peeling,11,12,13 massage of the margins of the MH,14 detaching the posterior pole with salt solution,15 inverted ILM flap technique,16,17,18 or a combination enlargement of the ILM rhexis joint with suction over the MH.19 More recent proposals include: transposing a pedicle of the ILM,20 transplanting an autologous free ILM flap,21 and even use of a free retina flap.22 There are currently no restrictions as to whether such patients should undergo repeat surgery and which technique should be used. There is also lack of comparative studies of the techniques mentioned. Autologous ILM transplant or autologous retina transplant show excellent primary results; however, long-term data are still awaited. The inverted ILM flap technique proved to be successful in treatment of most complicated cases of MHs.16,17,18 However, no data of failure of this technique are yet available. The main aim of this manuscript is to present the results from eyes in which primary surgery using inverted ILM flap technique to close the MH failed initially. In those eyes, during repeated surgery, the flap was reinverted again. We then discovered postoperatively that the ILM flap had moved away from the surface of the MH in all cases and, therefore, was no longer covering it. The secondary aim is to compare the results of secondary surgery regarding silicone oil use. This is a retrospective study based on our database from 2007 to 2016, aiming to present results of repeat surgery for MH. Silicone oil was used in selected cases at the surgeon's discretion. The institutional review board of the Ophthalmic Clinic approved the study. The research adhered to the tenets of the Declaration of Helsinki. Complete ophthalmic examination and spectral-domain optical coherence tomography (SD-OCT) (Copernicus HR; Optopol, Zawiercie, Poland) or swept-source OCT (SS-OCT) (DRI OCT Triton; Topcon, Tokyo, Japan) were performed prior to failed primary vitrectomy, before second surgery and then at 1 week, 1 month (± 7 days), 3 months (± 14 days), 6 months (± 25 days), and 12 months (± 30 days) after the second surgery. The closure type and defects of particular retina layers were noted. Closure types were differentiated as U-type, V-type, W-type, flap closure, flat-open, and elevated-open. Our group consisted of patients primarily operated with the inverted ILM flap technique from 2007 to 2016 in whom we failed to achieve closure after the first surgery.16 In this technique, following core vitrectomy, the ILM is stained with trypan blue (Membrane Blue, or Membrane Blue Dual; DORC, The Netherlands) for 45 seconds. Then it is partially peeled on an area of about 1 to 2 disc diameters, left attached along one edge of the MH to form a flap, and then inverted to cover the MH. Fluid-air exchange follows. In this group during repeat surgery, it was noted that in all eyes, the inverted ILM flap had reapproximated to its original position (Figure 2). It only needed to be inverted again onto the MH. Either air (12 eyes) (Supplementary Video 1 coming soon) or silicone oil (20 eyes) (Supplementary Video 2 coming soon) was injected into the vitreous cavity at the end of the procedure. The tamponade was chosen at the discretion of the surgeon, with silicone oil being opted for if the surgeon felt that the flap had a tendency to float back to its original position. In cases in which a third surgery was needed, silicone oil was always injected. Silicone oil was removed in all 20 patients after 3 to 6 months. Snapshot from repeated surgery of full-thickness macular hole (MH). The internal limiting membrane displaced to its original position (temporal to the MH) is visible after Membrane Blue staining. Retrospectively reviewing the database from 2007 to 2016, out of 830 patients initially operated with the inverted ILM flap technique, we found 32 eyes (3.8%) in which repeat surgery had been performed. For the remaining eyes, primary success with the inverted ILM flap technique was achieved. The baseline data for the group of 32 eyes (32 patients; eight men, 24 women; mean age: 68.8 years) are presented in Table 1. During the repeat procedure, the ILM flap was repositioned and either air (12 eyes) or silicone oil tamponade (20 eyes) was used. In three gas-filled eyes, the MH did not close despite a second surgery. In those cases, a third intervention was performed using silicone oil, and MH closure was achieved. Fovea contour improvements were noted. The most remarkable effect was an initial flap closure, which we noted in six eyes 1 week after surgery, yet in none of the eyes 12 months later. Most flap closures developed to either V-type closure or irregular closure.23 No surgical failures were observed in this group. Photoreceptor defects were noted in 30 eyes 1 week after surgery (94%). The number decreased to 25 eyes 12 months after surgery (78%). Outer retinal cystoid spaces present in 21 of 32 eyes (65%) 1 week after surgery, but were noted in only seven of 32 eyes 12 months later (21%). The inverted ILM flap was visible in all eyes immediately after surgery and its remnants could be seen in eight eyes (20%) 1 year after vitrectomy. The number of patients with nerve fiber layer defects increased from 11 of 32 (34%) to 20 of 32 (65%) during the follow-up. Mean visual acuity (VA) before the first surgery and after the first failed surgery was 20/250 Snellen (1.1 logMAR). Mean vision improvement after the second surgery was statistically significant: 20/123 Snellen (0.79 logMAR) 1 month after surgery, 20/70 Snellen (0.72 logMAR) 1 year after surgery (P < .05) (Figure 1). Improvement was noted in 28 of 32 cases (87.5%). VA remained stable in four of 32 eyes. Retinal detachment was observed in two eyes and successfully treated with pneumatic retinopexy in one eye and with scleral buckling combined with repeated vitrectomy in the second eye. Three eyes were pseudophakic before initial surgery. In three cases, simultaneous phacoemulsification and vitrectomy were performed during the second procedure. All eyes were pseudophakic at the end of follow-up. Fovea contour improvement and changes in fovea morphology are presented in Table 2. We regrouped the patients to analyze outcomes in eyes in which air tamponade was used versus those in which silicone oil tamponade was used. The baseline data and results were not statistically different between groups (Table 3). Final VA tended to be higher in eyes in which air tamponade was used (P = .049, Mann-Whitney rank sum test). However, in three eyes in which repeated surgery was performed with air, the MH did not close and a third intervention was needed, this time employing silicone oil. This study demonstrates that repeat surgery with the inverted ILM flap technique in refractory full-thickness MHs enables us to achieve satisfactory anatomical and functional results. Silicone oil tamponade reassures additional success during repeated surgery, since it allows us to modify the placement of the ILM flap up until the end of surgery due to improved visualization. Earlier studies reported that after primary surgery, there is a continuous improvement of closure type and a decrease of photoreceptor defects.2 Interestingly; these processes are much less noticeable in eyes after a secondary procedure. After repeat surgery, photoreceptor defects persist in more than 80% of cases even 12 months after reinverted ILM flap surgery. This might be due to either the longer duration of the MH or to some changes, both in retina and ILM tissue, which persist after primary surgery failure. After reinverted ILM flap surgery, we noted that 1 week after surgery, some MHs were closed only with the inverted ILM flap (flap closure; Figure 3). During follow-up we observed that the fovea fills with tissue and either a V-type closure or an irregular closure developed in most cases. Improvement of fovea anatomy after repeat inverted internal limiting membrane (ILM) flap technique. (A) Preoperative appearance. (B) Swept-source optical coherence tomography (SS-OCT) after vitrectomy with inverted ILM flap technique. 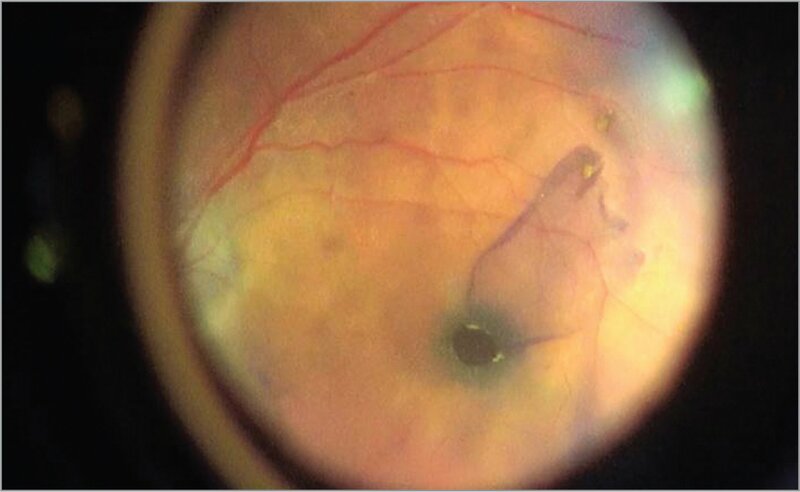 The ILM is visible at the margin of the full-thickness macular hole (MH). Two months later, repeated vitrectomy was performed. (C) Flap closure. Silicone oil tamponade. One week after surgery. (D) Fovea contour normalizes 1 month after surgery. (E) Further normalization after silicone oil removal 3 months after MH closure. (F) SS-OCT 12 months after repeat surgery. Remnants of the inverted ILM are visible on the fovea surface. If any part of the ILM was present, the inverted ILM flap technique would be recommended. It seems important that all failures after the inverted ILM flap technique were due to malposition of the flap during the first surgery. In all repeated procedures, we noted that the flap created during the first attempt had re-approximated onto the retina surface instead of covering and closing the MH. When facing a lack of ILM, different authors suggest an autologous ILM transplant,21 a lens capsule transplant,30 or even recently proposed autologous retina transplant22 to overcome this problem. These methods presented excellent results, which further confirm our data. It is extremely difficult to compare visual results in differently designed studies. Moissieiev observed improvement of VA in 62% of 25 cases, and final VA of 20/96 (0.68 logMAR) while enlarging the ILM peeling.11 D'Souza, with a similar technique, reported only 12% of 25 cases with improved VA (final VA of 20/252 Snellen; 1.1 logMAR).12 Rizzo et al., using heavy silicone oil in 23 eyes, reported 82% eyes with improved VA and a final VA of 20/81 Snellen (0.61 logMAR).5 Morizane et al., who used an autologous ILM free flap transplant, managed to improve VA in eight of 10 cases, with a final VA of 20/74 Snellen (0.57 logMAR).21 In our study, we achieved improvement of VA in 28 of 32 cases (87.5%), with the remaining four cases showing no change. VA improved from 20/252 before the first surgery to 20/70 Snellen 1 year after the last surgery. Summing up, heavy silicone oil and free ILM transplant or repeated surgery with temporal inverted ILM flap seem to have the best final VA results to date. In all studies, the results are worse when compared to successful primary surgery; however, they do encourage us to reoperate when primary surgery fails to close the MH. This study has several drawbacks, as it is retrospective in nature. To conclude, reinversion of the ILM flap during repeat surgery for refractory MHs results in improvement of retinal anatomy and VA. It must be considered that visual results are worse, when compared to the results of successful primary surgery.31 Additionally, our experience is that manipulations of the flap are easier in eyes filled with silicone oil than in gas filled eyes. From Ophthalmic Clinic “Jasne Blonia,” Lodz, Poland. Address correspondence to Zofia Michalewska, MD, PhD, Klinika Okulistyczna “Jasne Blonia,” ul. Rojna 90. Lodz, 91-162, Poland; email: zosia_n@yahoo.com.